In operation since 1998, Jackpot City is one of the longest running and well established online casinos on the market today. Powered exclusively by Microgaming’s leading online casino software, you will find some of the Internet’s most popular slots, table games and live dealer games here, with games available to play for free in practice mode or for real money bets using a range of safe deposit options. The team at BettingPlanet.com has dug under the surface of Jackpot City to give our readers an informed, unbiased review of everything this online casino has to offer. You can play games at Jackpot City in two formats – either for instant-play directly over your Web browser with no downloads necessary, or by downloading the sites premium casino software. Both methods are completely free to use, with deposits only required if you choose to play games for the chance to win real money. A browser-based mobile casino site of JPC is also available, offering a selection of Jackpot City’s most popular games compatible with iOS, Android and any other data-enabled smartphone or tablet for play on the go. A downloadable app doesn’t exist, but given the ease of the instant-play format there’s no need for a native app. While on the surface this sounds like a great offer, the welcome bonuses are only available for your first seven days of membership, after which they will expire. All bonus money is also subject to a 50X wagering requirement, which is one of the highest we’ve seen from an online casino, which definitely brings the appeal of this bonus offer down a few notches. The bonus package may come with some lacklustre stipulations, butarget=”_blank”t Jackpot City almost makes up for this with its ongoing promotions calendar. Once you’ve become a registered player at Jackpot City, every day that you sign in to your account you can take advantage of daily bonus offers, which are usually in the form of matched deposits or free spins. The more daily deposits you claim, the bigger bonus offers you have the power to unlock. On top of the Bonus Calendar, you can check out the ‘Promotions’ tab when logged into your account to see what special one-off promos Jackpot City has going at the moment. We’ve seen all kinds of bonuses, competitions and promos here in the past, including free spins tournaments, cash back offers, casino credits, cash prizes and real world prizes like holidays and tickets to exclusive events. A loyalty rewards program is available to all registered players at Jackpot City, where you will automatically start accumulating loyalty points every time you place a real money bet at the site. The more you play, the higher you will climb up different loyalty tiers, getting access to bigger bonuses and special treatment along the way. Different games contribute towards points differently, and all points expire within 90 days if not redeemed. The live dealer catalogue houses Live Blackjack, Live Roulette, Live Baccarat, Live Three Card Poker, Live Private Blackjack, Live Caribbean Stud Poker and Live Casino Hold’em, with buy-ins and betting limits catering to players with smaller bankrolls as well as the high rollers. While Microgaming’s casino software selection is varied and extensive, players who prefer multi-provider sites will be disappointed, as it lacks the variety that sites like House of Jack or Slots Million offer, without the innovation of games by rival software developers like NetEnt, Quickspin, Play’n Go and Betsoft. Jackpot City is licensed by two of the leading online gambling jurisdictions, Malta Gaming Authority (MGA) and the Kahnawake Gaming Commission. These certifications ensure all operations at Jackpot City run above board, with games, software and payouts audited and verified for safety and fairness. In addition, Jackpot City is certified by eCOGRA, the online gambling industry’s leading regulatory body. All transactions at Jackpot City are protected by 128-Bit SSL (Secure Socket Layer) digital encryption technology, scrambling all private information sent over the secured network so that your details can’t be hacked into by an unauthorised party. Jackpot City also fully supports responsible gambling practices, offering a self-exclusion option, deposit limits and access to gambling help services. Jackpot City offers one of the most comprehensive selections of online deposit options for players who want to play for real money. Along with the traditional credit card, web wallet, pre-paid card and bank transfer options typically found at online casinos, Jackpot City also caters to several country-specific deposit methods, making it easy for players from all regions to find a payment option that works for them. Deposits are available using multiple currencies, including $ (CA, AU, NZ), €, CHF, KR, zł, руб, Kč. 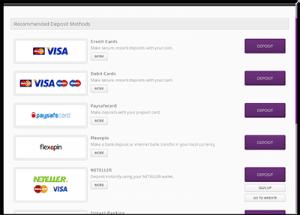 Withdrawals are typically available using the major payment systems, like Visa, MasterCard, Neteller, Skrill and bank transfers. Like all other online casinos, the deposit and withdrawal methods available to you will depend on which country you’re playing from. For further information, go to Jackpot City and check out the ‘Banking’ page for a full list of all accepted payment methods, with information available in multiple languages. Customer assistance is available at Jackpot City 24/7, either via email support or live chat. In our experience, live chat seems to be manned around the clock and we haven’t had to wait more than a few minutes for a response (although the help team will sometimes put you on hold for a significant time while they find the answer to your query). Jackpot City also offers customer support via telephone, with help available in multiple languages including English, French, Japanese, Russian and German. Refer to the casino’s ‘Support’ page for the phone number applicable to players from your country. Want access to a large range of Microgaming casino games in one safe venue? Head to Jackpot City Casino and sign up for a real money account to gain up to $1600 in matched deposit welcome bonuses.